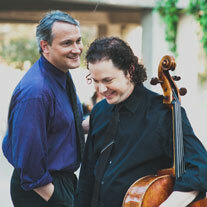 The distinguished cellist Matt Haimovitz returned to the University of Massachusetts Amherst Monday, together with the brilliant pianist Christopher O’Riley, with“Shuffle.Play.Listen,” an unusual (if not eccentric) concert before a full house in the Fine Arts Center Concert Hall. Both musicians were faultless in their playing, and O’Riley was perfect as an accompanist even when the music demanded heavy chords and fortissimo passages full of brilliant scales and arpeggios. He is known as the host and accompanist of NPR’s Sunday program “From the Top,” and his career has included transcriptions of rock music and jazz, as well as the classical canon. Haimovitz, well known in western Massachusetts (he once lived in Northampton, and was on the UMass faculty), has, like the eminent cellist Yo Yo Ma, played in what used to be considered unusual settings, such as bars and clubs. He has, like O’Riley, been a pioneer in extending the range of his instrument’s literature from the classical canon to rock and jazz. The audience could expect an extraordinary mix of classical, pop and jazz pieces, and they were not disappointed. The performers did not always announce what they were about to play nor was there a printed program. As the word “shuffle” in the concert’s title implied, the order of the pieces was both unusual and unexpected. The only piece to suffer from this was Beethoven’s “Twelve Variations on a Theme of Mozart,” which seemed austere in its setting between modern pop pieces. Here O’Riley played with lucid delicacy and Haimovitz switched, as it were, to a more restrained style. The concert began with music from 1958, composed by Brian Herrmann for Alfred Hitchcock’s film masterpiece, “Vertigo.” It continued with a song by the British rock band Radiohead, performed with intense emotion by Haimovitz. Next, the duo performed the cello sonata in C major composed by Sergei Prokofiev in 1949, a time for Russians of the joy of liberation from the war and sadness for the damage and immense loss of life that it caused. Both musicians were fully engaged in this difficult work, playing as one, yet allowing each to come forward brilliantly when the music demanded. This work was the central piece of the program in scale and substance, and the most satisfying. There followed a contrasting piece by the Argentinian Astor Piazzolla, who died in 1992. His music was devoted to the tango, whose style he extended to what he called the nuevo tango, with its rich counterpoint of contrasting rhythms and harmonies, energetically played, an invitation, it seemed, for the audience to get up and dance. In addition to the Beethoven, the second half included a very energetic piece (not announced) that showed off the brilliant bowing of the cellist. Later there was an exceptionally gentle and beautiful piece, “Orchard,” by Philip Glass. To end the concert the performers turned to the music of John McLaughlin, a virtuoso guitarist, now in his 70s. In the 1970s McLaughlin had formed a small orchestra called Mahavishnu, a name sometimes used by McLaughlin and indicative of his interest in and use of Indian music. A single hearing was not enough to gauge the depth of this captivating music. For their encore the players chose “In the Backseat,” a song from the Canadian rock group Arcade Fire. True to the song’s lyrics — “I like the peace / In the backseat / I don’t have to drive / I don’t have to speak / I can watch the countryside / And I can fall asleep” — the selection brought a quiet and peaceful ending to the concert.